What's the best way to start a letter? When writing a letter for professional purposes, an appropriate greeting is extremely important. Your greeting sets the tone for your letter, and is an indicator of your written communication skills. When deciding which salutation to use, you should consider if you know the person, and how well. If you are writing to someone in a professional capacity that you have known personally for many years, it is appropriate to use only their first name. Otherwise, it is best to use Mr., Ms., or Dr as an appropriate business letter salutation. If you have any doubts about which salutation you should use, err on the side of caution and use the more formal style of address. Try not to be tempted to begin your professional letter with informal salutations like “Hello,” “Greetings,” “Hi There,” or “Good Morning” if you don’t know the name of your contact person. 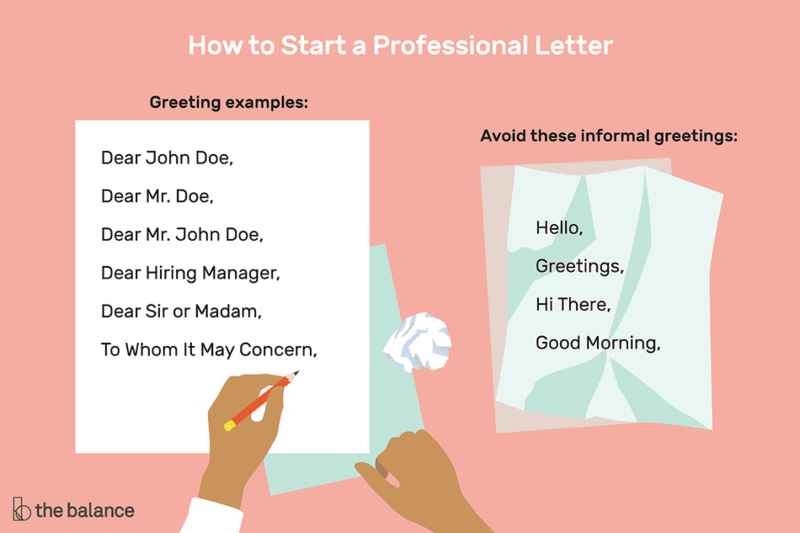 While those informal styles of greeting are fine for casual emails to friends or even for more formal emails you might send out to groups of people, in a professional letter you’ll need to use a personal salutation, one with either a first and/or last name (“Dear Mr. Doe”) or a job title (“Dear Hiring Manager”). If at all possible, use a contact name when you write. This makes your letter more personal, and it creates an immediate relationship with the reader. If you don’t have a contact name, you can do some research to try to find out the right person to address your letter to. Sometimes the name will be on the company website, or you may be able to find the right person on LinkedIn. Perhaps one of your colleagues or contacts may know who the appropriate person might be. You can also call the office of the unknown person you are writing and ask the receptionist for their name by explaining your reason for calling (Example: “I am applying for a job with your company. Can you please tell me the name of your Hiring Manager so that I know to whom to address my cover letter?”). It doesn’t take much extra time to make the attempt to find a name, and the sentiment it conveys is worth it. Sometimes, despite your best efforts, you just can’t find a name to address your letter to. In that case, you have a variety of choices, all of which are professional and appropriate. The more information you have about where you are sending the letter, the better (for example, to the human resources department of the company, or to the manager of the department related to your inquiry). This way you can make a more targeted choice when selecting your greeting. When you have a name but are unsure of the gender of the person you are writing to, it is acceptable to leave out the honorific, and use the first and last names alone. After your greeting, you would begin your first paragraph, which is usually an introduction that lets the reader know who you are and what you are writing about. If you have a mutual acquaintance who referred you to the reader, you should mention them at this time. The body of your letter normally consists of a paragraph or two of text. Here you can elaborate on the theme of your letter and provide supporting details to the subject. You’ll want to keep it concise, and pertinent to the person and the topic. Be thorough but don’t repeat yourself or go on and on about unimportant details. Next, you’ll need to sum up your letter. Your summary should include a thank you to the person for his or her time and consideration. If you plan to follow up later, you can also provide the details of when and how you will contact him or her. Finish your professional letter with a closing, such as “Sincerely” or “Regards.” If you plan on sending the letter by postal service, your signature should be followed by your typed name. If you’re sending an email, your typed name should be followed by your contact information, which you can type in manually or have it done automatically for you. Here's how to set up an automatic email signature.